Here we will prove that in a triangle the sum of any two sides is greater than twice the median which bisects the remaining side. 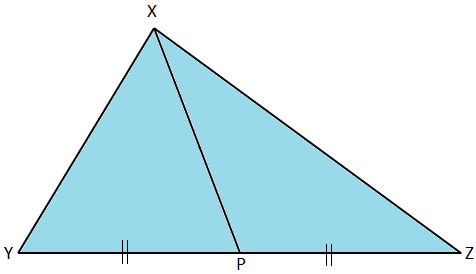 Given: In ∆XYZ, XP is the median that bisects YZ at P.
To prove: (XY + XZ) > 2XP. Construction: Produce XP to Q such that XP = PQ. Join Z and Q. 2. By SAS criterion of congruency. 4. In ∆XZQ, (XZ + ZQ) > XQ. 4. 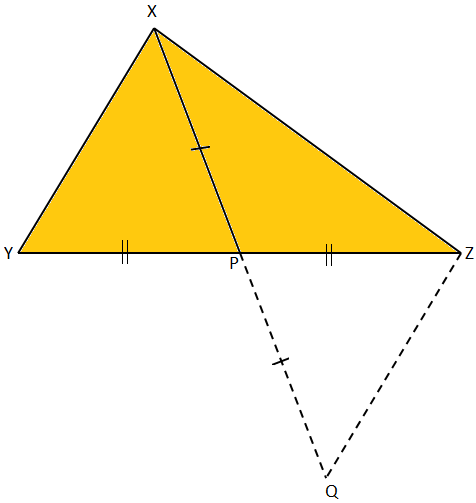 Sum of the two sides of a triangle is greater than the third side. 5. (XZ + XY) > (XP + PQ). 5. XY = ZQ, from statement 3.